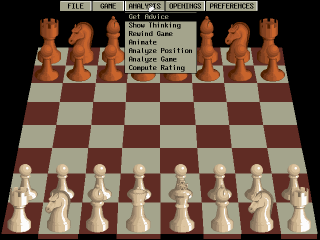 a commercial chess program for the IBM PC, running under PC-DOS in VGA or SVGA mode, featuring 2D and 3D boards within a GUI with mouse and menu control. Grandmaster Chess was devoloped by IntraCorp, Inc., published in 1993 by Capstone Software. The chess AI was contributed by John Stanback, who modified his Zarkov 2.5 engine to be more selective . The program had the limited ability to learn from its mistakes utilizing a persistant hash table and saving any situation where the score changes against it. It will then recognize this situation as a losing one before it happens and take steps to avoid it, if it occurs in another game . The CD package further included the DOS program Terminator 2: Judgment Day - Chess Wars , also with Stanback's chess routines , featuring sounds and characters from the movie Terminator 2: Judgment Day as pieces, and captures animated a la Battle Chess. This page was last edited on 22 March 2019, at 07:55.